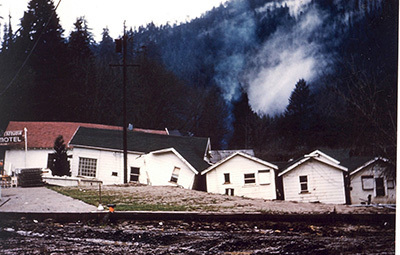 The towns along the South Fork of the Eel River got some unwelcome Christmas presents in 1955 and 1964. On December 20, 1955, torrential rains caused the South Fork of the Eel River to overflow to record heights. The little town of Weott, just north of the old Stephens Grove CCC Camp, sustained heavy damage. 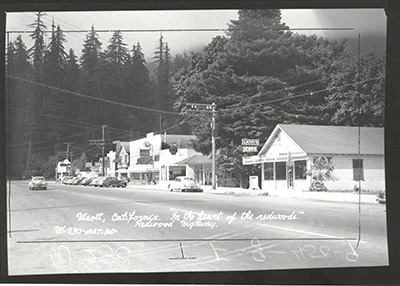 The first photo at right shows Weott in 1950. 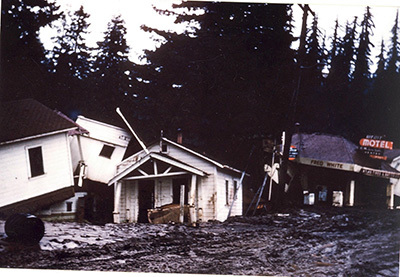 Following are two photos of the town after the 1955 flood, taken by one of the State Park rangers. Nine years almost to the day later, the South Fork flooded even higher. Weott was essentially washed away. This time, it was rebuilt on higher ground. The photo at far right shows the marker that stands at the old site of Weott, indicating the 1964 flood level. It wasn't at the sign that says "High Water Dec 1964." It was at the top of the pole: the flood crest was 46 feet at Miranda, 11 miles south. The 1955 crest had been just under 43 feet. At the time of the 1964 flood, the clearcutting of the slopes above Bull Creek was blamed for causing the massive damage along the Eel south of the two streams' confluence. This triggered a successful push to add Upper Bull Creek to Humboldt National Park. Lower Bull Creek and Bull Creek Flats at the confluence with the Eel were already part of the park during the CCC period. 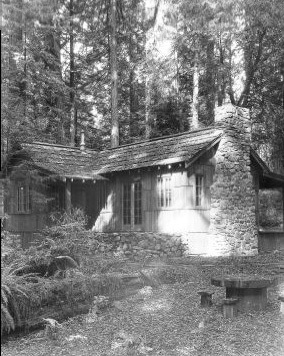 The CCC performed extensive campground development (including a camp warden's house, shown in the photo at right) just north of Bull Creek Flats. Sadly and not surprisingly, this campground did not last through the Eel flood events, and was never rebuilt.